The UNIFIL Maritime Task Force (MTF), deployed since October 2006, supports the Lebanese Navy in monitoring its territorial waters, securing the Lebanese coastline and preventing the unauthorized entry of arms or related materials by sea into Lebanon. Another important aspect of MTF’s mission is its contribution to the training of the Lebanese Navy, so that it may execute, in the future, those maritime security tasks currently carried out by MTF. The Maritime Task Force was deployed at the request of the Government of Lebanon within the mandate of the United Nations Security Council resolution 1701 (2006). This is the first Naval Task Force ever to take part in a United Nations peacekeeping mission. The deployment of MTF after the conflict of July-August 2006 was a landmark move that prompted Israel to lift its naval blockade of Lebanon. Following the conflict, an Interim Maritime Task Force was deployed until 15 October 2006, when the UNIFIL Maritime Task Force led by Germany took over. On 29 February 2008, Germany handed over the command of the UNIFIL Maritime Task Force to the European Maritime Force (EUROMARFOR) led by Italy. Under this arrangement it was for the first time that EUROMARFOR - a Maritime Multinational Force formed in 1995 by France, Italy, Portugal and Spain to carry out naval, air and amphibious operations - operated under a United Nations mandate. The EUROMARFOR held command of UNIFIL MTF for one year, first under Italy's lead (29 February - 31 August 2008) and then under France (1 September 2008 - 28 February 2009). On 1 March 2009, France/EUROMARFOR handed over the command of MTF to Belgium. On 30 May, Belgium handed over the command of MTF to Italy. Italy transferred the MTF authority to Germany on 31 August, and Italy assumed command again on 1 December 2009. On 24 February 2011, Brazil assumed the command of MTF and has held it since then. Brazil has also provided the MTF flagships since November of 2011. A total of 15 countries have contributed to the MTF: Bangladesh, Belgium, Brazil, Bulgaria, Denmark, France, Germany, Greece, Indonesia, Italy, the Netherlands, Norway, Spain, Sweden and Turkey. UNIFIL-MTF currently comprises naval units from Bangladesh (1 ship), Brazil (1 ship - Flag Ship and 1 helicopter - Super Linx AH-11A), Germany (1 ship), Greece (1 ship), Indonesia (1 ship and 1 helicopter - Dauphin AS 365) and Turkey (1 ship). It is currently commanded by Rear Admiral Eduardo Machado Vazquez from the Brazilian Navy. Since the start of its operations on 15 October 2006, MTF has hailed 90,332 ships and referred 12,363 vessels to the Lebanese authorities for further inspections. Only this year, the MTF reached the mark of 713 trainings and exercises with the Lebanese Navy, similar number of the total of trainings from each of the last two years. With a lot of creativity, MTF increased the diversity of exercises, in quantity and quality, creating four new exercises that will support the Lebanese Navy in the enhancement to assume the task of Maritime Interdiction Operations. 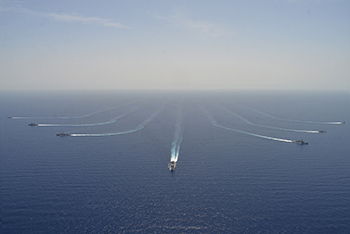 In this way, two assets from the Lebanese Navy, PB Nakoura and PB Tabarja, were certified, after months of intense preparing, by MTF, to remain uninterrupted at sea, for a period of 24 hours and 48 hours, respectively.